Lavera Vegan Clean Cleansing Milk cleans gently, removes impurities and makeup residue while respecting the delicate skin of your face. Composed of natural active ingredients like organic mallow, it soothes irritations and instantly soothes your skin. Its richness in organic almond oil hydrates and protects the skin while promoting its blood circulation. This cleansing cream with a creamy texture deposits a light protective film on the skin that protects it from dehydration. Your skin is soft and clean, ready to receive its organic care ! 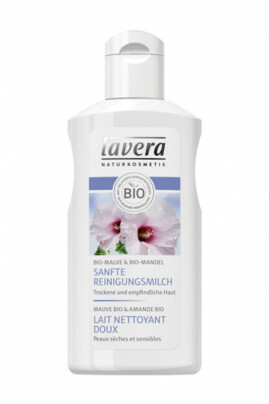 With Lavera Gentle Cleansing Milk, make-up removal becomes a veritable moment of sweetness ! Morning and evening on the face, neck and décolleté, apply a dab of Vegan Gentle Cleansing Milk and gently massage. You can either rinse it with lukewarm water or remove it with a washable cleansing pad or an organic cotton make-up remover. To remove eye makeup, soak a moist organic cotton disc with a little mild cleansing milk.